There are many wonderful things you can do with your iPhone 7. Among these is the ability to send and receive audio messages. You can record what you have to say and send it off to the person of your choice. When you’re creating a message, just follow these steps to record audio. With Messages open, tap the New Message button in the top-right corner. You will see the To field. Enter an addressee’s name in the To field. Tap and hold the Audio button. The Audio the microphone symbol to the right of the screen). Speak your message or record a sound or music near you. The iPhone has a surprisingly sensitive set of ears. 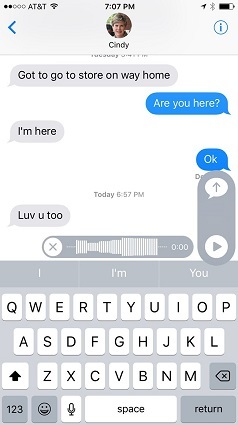 Tap the Send button (an upward-pointing arrow at the top of the recording circle). The message appears as an audio track in the recipient’s Messages inbox. To play the track, she just holds the phone up to her ear or taps the Play button.